IT'S CHRISTMAS EVE. WHAT'S A JEWISH PARENT TO DO? As a Jewish parent, I always feel a bit like Shylock on Christmas Eve. Specifically, Shylock when he’s yelling at his daughter, Jessica, to stop ogling the Christians who are partying outside his window. My children, too, feel like they are in a “sober” house while everyone else is laying out cookies for Santa and whooping it up. I’ve patiently explained to my kids that Santa is a fictional character and that Christian children get presents from their parents just like they did on Hannukah (Remember Hannukah? Let me help you out with that: It was six freaking days ago). And they probably get the same presents from the same stores too. But they still feel deprived. Perhaps it’s just my children, but I’m hoping that some of you may have had a similar experience. So I have a new idea that I wanted to pass along. 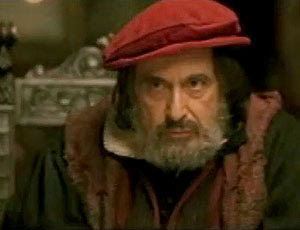 If Chinese food and “Avatar” don’t cheer up your kids, declare a “Family Movie Night” and rent Michael Radford’s 2004 adaptation of The Merchant of Venice (a.k.a the Al Pacino Merchant of Venice). Radford’s version is unique in that he has Jessica feeling guilty for treating her father like crap. She realizes that partying with the beautiful Christians is not all it’s cracked up to be, and she misses her father. When I saw this in the movie theater, I gasped very loudly when Jessica appeared at the end, staring wistfully out at the sea--and at the family ring on her finger that she had supposedly sold for a monkey. 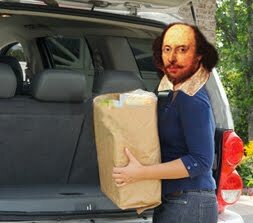 There is no such scene in Shakespeare's play! Think about it. This movie could become your family’s tradition on Christmas Eve. Kind of like your own version of It’s a Wonderful Life but without the happy ending. Finally, as your family watches the closing credits with a heavy heart, blast Adam Sandler’s “Hannukah Song.” Hopefully now they know that these are good times to be relished, even if they are Jewish and it’s Christmas Eve. And also that if they don’t have a good time and appreciate you, they’ll be struck down with terrible, terrible guilt at a later point in their lives. you can also move to israel and have non of that...but then again you'll have other issues to deal with.